This 6ft x 6ft (WxH) Dip Treated Waney Edge Lap Fencing Panel is the perfect way to create a private and secure border around the edge of your garden. We have constructed this wooden fencing panel using rough sawn overlap timber; this creates an attractive finish that is also robust and secure. Framing is fitted to the outer edges and down the center of this dip treated fence panel to ensure it can withstand winter weather conditions. 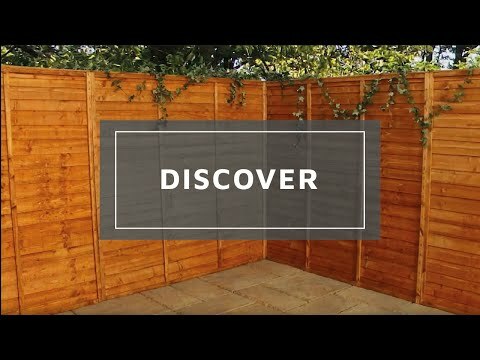 The classic design of this wooden fence panel means it will look great when used for a variety of purposes; whether it is used to simply cordon off the edge of your garden, or to act as barrier for creating a private seating area. We dip treat these fencing panels to offer protection against weather damage, a 10-year anti-rot guarantee is supplied for your peace of mind. Review:It value for money and meet my expectation. Our Reply:Good afternoonThank you for your feedback regarding your recent purchase. it is good to know that you were happy with your fence panels. Thank you for letting us know that you received excellent service from Waltons. Review:Good value for money with free delivery as well! I am so glad that you are pleased with the value for money of your fencing and I thank you again for your much appreciated review. I am glad to know that you are both happy with the quality of your fencing and the service received. Thank you again for your positive review. We're pleased to hear that your fence panels are good value for money and you are happy with the quality. We're pleased to know you're so happy with your fencing. Thank you for letting us know your fence panels were good value for money. I am glad that you are pleased with your fencing and should you have any queries please contact us on either 0800 029 1000 or service@waltons.co.uk. Please accept my apologies for the fact that there was some slight damage upon delivery. I am glad we were able to make an offer so this could be rectified and I am pleased that you are happy with the overall service. Thank you for your review! Review:Good panels. The kind that slide into grooves at either end and can be manipulated if tight. I am glad that you are happy with your fencing and I thank you again for your positive review. It is great that you are pleased with the quality of your fencing and thank you again for leaving your great feedback. I am very pleased to know that you are extremely satisfied with the quality of your fencing and I thank you again for your review! It is wonderful to know that you are happy with the quality of your fencing and I thank you again for your feeback. I am glad that you are happy with the service and quality of your fencing and I thank you for your great review! I am very glad that you are pleased with the quality of your fencing and I thank you again for the positive feedback. I am so pleased to know that you are very happy with the great quality of your fencing and that installation was straight forward. Thank you again for your positive review. I am so pleased to know that you found the service we provided to be excellent and you are happy with the good quality of your fence panels. Thank you for taking the time to offer your great feedback! Review:What I wanted but uneven at the edges so needed trimming to fit in to fence posts. I am so glad to know that you are happy with your fencing and that you are pleased with the value and quality of these. Thank you for your brilliant feedback! Review:Good quality at a decent price. Thank you very much for your brilliant feedback, please don't hesitate to contact us when you are ready to re-order. It is great that you have found your fencing to be a great product and you are pleased with how it looks in your garden. Thank you again for your great feedback, we appreciate it! Review:Fantastic quality panels and can't fault the price. Highly recommended, look great in the garden. Review:I buy all my fence panels from Waltons. They are good quality at a delivered price that is lower than any other supplier that I can find. Delivery is also made within the agreed time slot.